Comments and suggestions are most welcome, both on substance and wording. Please bear with us that none of the (current) authors is native English language-abled. When we talk about ‘theory’ it will be mostly related to international frameworks with guiding principles for urban and territorial planning, while the ‘praxis’ will be mostly about the implementation of these principles in our concrete living spaces – the ‘localisation’ of those universal principles. Occasionally we might also relate to planning theories rooted in academic research and applied practices, such as theories related to territorial governance, strategic planning, planning participation, urban growth models, etc. ‘Praxis’ (from Ancient Greek πρᾶξις) is the process by which a theory, lesson, or skill is enacted, embodied, or realized. 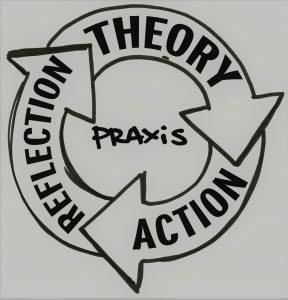 Praxis may also refer to the act of engaging, applying, exercising, realizing, or practising ideas. This has been a recurrent topic in the field of philosophy, discussed in the writings of Plato, Aristotle, St. Augustine, Immanuel Kant, Søren Kierkegaard, Karl Marx, Antonio Gramsci, Martin Heidegger, Hannah Arendt, Paulo Freire, Ludwig von Mises, and many others. It has meaning in the political, educational, spiritual and medical realms. From our perspective, ‘praxis’ will also refer to the act of engaging, applying, exercising, realizing, practising or co-creating ideas. ‘Engaging’ is crucial, hence the stress on co-creating urban and non-urban territories in a more interactive way than the traditional one-way ‘consultation’ of people and stakeholders. Hence, Placemaking is considered as the voluntary act on co-creating better places for humans and other species to thrive, harnessing and bolstering its capital assets. While we can learn a lot from both good and bad praxis, we prefer to focus on ‘inspiring practices’ of placemaking. Territorial Capital Institute (TCi) explores tools and methods to map and unlock the human and ecological capital of a given territory or space, aiming at a more sustainable territorial development. Territories can be either determined by human borders (such as countries, provinces or municipalities) or by natural boundaries or transition zones (such as rivers, mountains, seas, climate zones etc.). Territories are both urban and non-urban spaces. While more than half of humankind is living in cities lets not omit the smaller half living and working in rural villages and towns. There is a lot to say for stepping up metropolitan governance as the connective tissue between local and global planning. However, urban-rural complementary and partnerships are equally important, including preserving and restoring fragile ecosystems in and outside urbanised territories. While urban planning is primarily focusing at local governance, territorial planning aims at subsidiary governance at all levels of territorial conduct: from local to regional to national and transnational. Territorial capital should not be confused with the capital of a certain territory, e.g. Madrid as capital city of the territorial entity of Spain. Yet being the capital city of a country can be considered as an asset for e.g. economic and social capital development (= positive capital) or to some extent even as a burden (= negative capital). Overall, the territorial capital approach has its focus on the active and dormant or potential assets that can increase the capital base of given spaces and places. Territorial planning should enable validating positive capital and reversing negative capital of given territories or spaces. Territorial cohesion is the act of ‘territorial capitalization’ or balancing out the needs and aspirations of all territorial ‘share-holders’, including non-human species. Territorial justice is the complementary act of a human rights-based planning approach – with equal access to opportunities and commons for all – ‘leaving no one and no place behind’, to paraphrase the motto’s of the Sustainable Development Goals and the New Urban Agenda.